Compare Australia’s domestic airlines on customer satisfaction. Jetstar, Qantas, Tigerair, Virgin Australia and Regional Express rated on service, flight schedule & availability, in-flight offerings, flight punctuality, value for money and overall satisfaction in 2018. Canstar Blue research finalised in April 2018, published in April 2018. 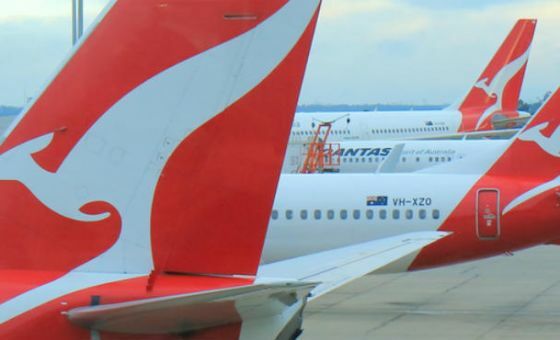 In a competitive market, Qantas has taken out the top spot, with Australians rating the Flying Kangaroo five stars in the majority of categories, including its service, flight scheduling, in-flight offerings and flight punctuality, as well as overall satisfaction. 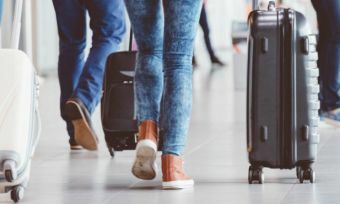 Catching a flight can be as exciting as it is stressful, with consumers given plenty of options to consider when they need to get from A to B. Which flight you ultimately decide to board will come down to a few personal preferences, as well as what you like to do with your time while you’re in the air. For instance, if you’re big on movies – or want something to keep the kids entertained – you may want to look for an airline with in-flight entertainment, or if you’re flying at lunch time, you might want to choose an airline that serves in-flight meals to avoid paying too much for a snack at the airport. However, if you’re not too fussed about all the extras, or plan on spending most of your time on the plane asleep, simply going for the lowest price is a reasonable option. It’s all about what gives you value for your money. 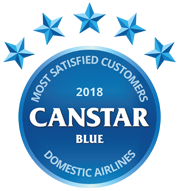 In Canstar Blue’s latest survey on the subject, consumers were asked a variety of questions about their preferences and experiences with Australia’s domestic airlines. The survey found that just over half of us (55%) tend to book with the same airline every time we travel – which suggests there is a fair amount of airline loyalty, but probably not as much as the airlines would like. That’s good for keeping them on their toes. When asked why they always tend to travel with the same airline, 37% of survey respondents were of the opinion that their regular airline is simply the best to travel with, while 28% told us it’s because it is usually the cheapest option, and a further 19% stated it’s because they want to rack up frequent flyer points. With Aussies choosing airlines based on a variety of different reasons, it’s best to look into what each airline can offer you the next time you have to travel. A good place to start is our customer satisfaction ratings. Qantas was rated highest overall, achieving five stars in terms of flight scheduling & availability, flight punctuality, in-flight offerings, service and overall customer satisfaction. It rated four stars on value for money. Virgin Australia also recorded five stars for flight scheduling & availability, flight punctuality and service, with four stars for in-flight offerings, value for money and overall customer satisfaction. Tigerair was the only airline to achieve five stars on value for money, but recorded a mixed bag of results, including three stars for flight punctuality and service, with four stars overall. Jetstar scored four stars across most research categories, including value for money, service and overall satisfaction. Like Tigerair it received just two stars for in-flight offerings. Regional Express scored four stars for service and flight punctuality, but scored three stars on value for money and overall satisfaction. The two ‘premium’ airlines certainly achieved better outcomes in most areas, suggesting that paying a bit extra – if required – may be worth it. But as we mentioned, it all depends what you want from your flying experience. As well as revealing which domestic airline is highest rated in Australia, our research also identified the key drivers behind overall customer satisfaction, with good service of the utmost importance. Recognised globally, the Flying Kangaroo is nearing its 100th year of operation, and is one of Australia’s most recognisable brands. Domestically, Qantas offers flights to and from all state capital cities, as well as popular destinations such as Hamilton Island, Broome and Cairns, offering plenty on board to make your flight comfortable. In-flight entertainment and meals are included on all domestic flights, meaning you can keep the kids entertained on those long journeys, while keeping up to date with the latest releases. Qantas planes are also fitted with PC power and USB ports so that you can charge your devices. For those who always pack more than they need for their trip, Qantas offers a luggage limit starting at 23kg for economy class travellers, which can be bumped up to 32kg for Qantas members. For those flying Business, non-members can have two pieces of luggage up to 32kg, while members can have up to three pieces of 32kg luggage meaning you won’t be short of clothes on your travels. All carry-on luggage is limited to 7kg. While Qantas may not always be the cheapest option, it is one of the most prominent airlines available, with one of the largest fleets available, meaning you should be able to find a flight that fits in with your schedule. With the bonuses of entertainment and food on every flight, Qantas makes flying that much easier. The Qantas Lounge is also well known amongst travellers, allowing weary flyers a bit of rest and respite in between flights. Established in 2003, Jetstar has established a reputation as a budget option, providing both international and domestic flights. Flying into multiple cities and towns in every Australian state and territory, Jetstar offers a lot more than flights for the local traveller. With a price-beat guarantee, as well as additional services such as car hire and hotel booking available on its website, Jetstar looks to give consumers the full holiday experience, rather than simply a way to travel. 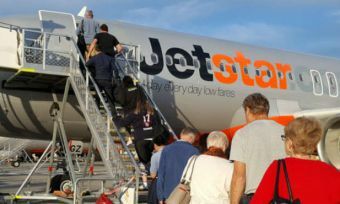 The airline also offers membership to its Club Jetstar, which will give users early access to sales, member-only fares, discounts on baggage and seat selections, as well as a few bonuses with partnered businesses. At an annual cost of $49.99, in addition to a $49 joining fee, Club Jetstar may be worthwhile for those who travel regularly. Additionally, Jetstar also offers BusinessHub for those who primarily fly business class, allowing users to save on time and money, with discounts and priority servicing available through the airline. On the flights themselves, Jetstar may feel a little lacking in comparison with some of the competition, with both in-flight entertainment and in-flight meals costing you extra. Meals can either be purchased on board, on pre-purchased while booking your flights, and will generally set you back around $10 to $15 depending on which flight you’re on. The in-flight entertainment will also set you back around $10, which can be purchased while booking your flights. For those in business class, in-flight entertainment comes free. For those looking to bring a lot on their holiday, Jetstar offers up to 25kg of luggage through the Starter Plus bundle, with 40kg of luggage allowed with the Starter Max bundle. Carry on remains at 7kg, while business class patrons can take up to 14kg of carry on before surcharges apply. Jetstar also offers an app for users to search and book air fares, as well as manage their bookings and keep up to date with all the flight details. Often viewed as the most budget airline, Tigerair may not have the reach of the other airlines in terms of destinations, but still has plenty of towns and cities on its radar for consumers traveling on a budget. Flights are available to all capitals, as well as major areas on the Eastern coast, such as Coffs Harbour, the Gold Coast and the Whitsundays. 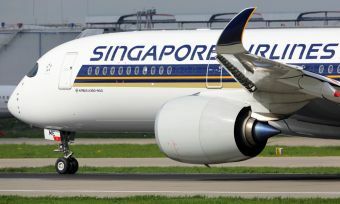 Because of the generally cheap prices, customers may have to sacrifice some comforts, such as in-flight entertainment and free in-flight meals. Meals are, however, available for purchase, which can be done while booking your flight online, with a variety of snacks, drinks and meals available for purchase. Also available for purchase are collectibles for the plane enthusiast, as well as playing cards, activity cards and colouring books to help keep the kids happy during the flight. If you’re after in-flight entertainment however, you’d best bring your own. For luggage, Tiger adheres to the traditional 7kg of carry on luggage, but does offer the Cabin+ option, which bumps your carry on to 12kg. Larger baggage fares will be affected by the length of the flight, with longer flights incurring a higher fare. For those who turn up to the airport too early, Tiger also offers the MoveMe option, allowing passengers to swap onto an earlier flight. 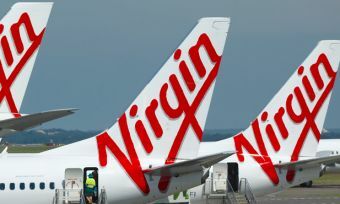 Offering an expansive range of destinations, including Alice Springs, regional Queensland and Western Australia, on top of the capital cities and top tourist destinations, Virgin Australia has established itself as one of the premier airlines in the country. When booking, Virgin offers a range of fare types to choose from, although it’s best to do some research beforehand as some options aren’t available on all flight types. For domestic flights, there are a number of flexible options for both economy and business class flyers to grab the best seats, as well as take a bit of the stress away from the booking process. Baggage is limited to 23kg for all economy flyers, with the standard 7kg carry on limit also imposed, with business class travellers and Velocity members allowed larger allowances, suitable for those who like to bring back souvenirs when they travel. When you’re all strapped in and on your way, you can set up the complimentary in-flight entertainment, which is available both in the seatback screen or from your smartphone or tablet. Simply download the Virgin Entertainment app and a selection of movies, television shows and music streaming options will be available for the duration of the flight. Complimentary food is also provided on all domestic flights, perfect for those flying during a meal time. Complimentary teas, coffee and water also available as well as complimentary beer, wine and soft drinks available on flights departing between 5-7pm Monday to Friday, helping you cruise into the weekend. Similarly to Qantas, Virgin is generally a bit more expensive than other airlines, but also offers a range of services and extras that will make the flight more comfortable and enjoyable. Established back in 2002, the Regional Express, or Rex for short, offers travellers routes to more regional areas, handy for those who live off the beaten track. With a range of smaller aircraft, capable of carrying around 30 passengers, Rex offers an option for those looking to make their way into the big smoke. Passengers can check in up to 15kg in baggage, 23kg for Rex Flex members, with 7kg of carry-on baggage also allowed. For larger items, it’s better to check out its website or local centre, as the smaller aircraft may not be able to accommodate for larger items depending on the flight. Rex offers many of the same comforts as other airlines; including insurance, lounge usage, online booking and rewards, meaning you’ll get big deals from the small airline. Rex also offers a wide range of ticket pricing depending on if you’re a member, as well as child and senior discounts. Be sure to check out its website or your local centre for more details. Rex’s website also offers car hire and hotel information for those looking to stay for a few days. Frequent flyer programs have become hugely popular in recent times, with plenty of companies banding together to help travellers rack up their points through purchases. While it may take a while to save up enough points to bump yourself up to First Class, many consumers are still willing to stick it out. 56% of survey respondents who have a frequent flyer membership said they choose where to buy various goods and services based on the points they receive. Did you know you can even earn frequent flyer points by paying your energy bills? 57% of Aussies think their frequent flyer program offers good value, our latest survey found, while 59% would switch airlines if they were offered a better rewards package. Indeed 21% of those surveyed said they were previously a member with another airline before switching. However, one in three members (33%) thinks they will always stick with the same airline. Which domestic airline should I travel with? Ultimately which airline you should fly with will be dependent on a range of factors, including personal preferences, your schedule and budget. If you know the staff at your local airport by name, chances are you’re locked into an airline and aren’t looking to deviate any time soon, but if you’re just an occasional flyer – or are looking to fly for the first time – it may pay off to do a bit of research into what options are available to you. If price is your only real concern, then budget airlines such as Tigerair and Jetstar may be your best bet, but if you’re after a bit of comfort or a meal, then airlines such as Qantas and Virgin may be more your style. As they say, it’s not the destination but the journey that’s important, so be sure to look into which airline you’re flying with to make the most of your time in the air. Canstar Blue surveyed 3,048 Australian adults across a range of categories to measure and track customer satisfaction, via ISO 26362 accredited research panels managed by Qualtrics. The outcomes reported are the results from customers within the survey group who have taken a domestic flight in the last 12 months – in this case, 1,497 people.